I did not really think much about Music Appreciation, or Composer Study. Honestly, I pretty much figured we had it covered. Our children, one now off to college, one a sixth-grader, both take piano lessons, and in my humble estimation, there is no better way to learn about the vast differences in mood, tonality, style and organization between Baroque, Classical, Romantic and Contemporary, than by learning and performing works of each period. Also, no matter how reluctantly, the children have been exposed to a great deal of choral music from all periods, as Mr. Garner and I rehearsed and immersed ourselves in a vast array of superb choral works by composers such as Bach, Handel, Mozart, Vivaldi, Purcell, Mendelssohn, Brahms, Puccini, Rachmaninoff, Britten, Thompson and Lauridson. What convinced me to think differently was an article I read from a Pinterest Pin! Barbara Zuck writing for The Columbus Dispatch, an article entitled 20 Classical Works You Should Know, reminded me that there are a great many wonderful symphonic works that we would all enjoy hearing! Of course! Our local Charlotte Mason group leader, Wendy, mentioned one evening that the easiest and least expensive way to implement Art Study and Music Study is to use what you have, and see what is going on in the area too. She suggested planning music and art study around local art exhibits and the concert seasons of the Opera and Symphony, and also see what you already have at home. 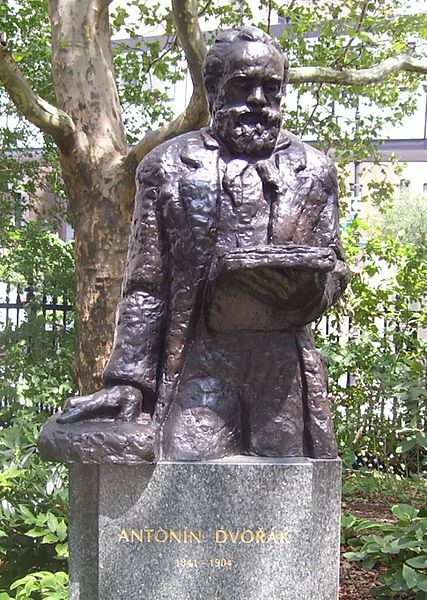 A statue of Antonin Dvorak places in Stuyvesant Square in New York. I was still lagging behind in this area, when the opportunity arose for me to join a choral group which will be singing an unfamiliar (to me) work by Anton Dvorak, his lush, soaring Mass in D. After listening to the Kyrie on YouTube, I was hooked! It occurred to me, why not have GraceNotes study Dvorak? Suddenly I had our composer for the first term! I have limited knowledge of Dvorak. I prepared Songs My Mother Taught Me, for a recital. It is the fourth of seven poems by Adolf Heyduk set to music in a collection entitled Gypsy Songs Opus 55. It is a beautiful, moving piece, and I loved singing it, but that is the extent of my knowledge other than familiarity with snippits of the New World Symphony No. 9 in E minor, Opus 95. We looked at our CD collection (yes, we somewhat pre-date ITunes) and found that we had a good recording of Dvorak’s New World Symphony! Wonderful! His New World Symphony is Number 8 on the list of 20 Classical Works You Should Know. I had picked up two books at our local used curriculum store Moore Expressions over the summer, Piero Ventura’s Great Composers which has breadth, but little depth, and Patrick Kavanaugh’s Spiritual Lives of the Great Composers which I really like. Kavanaugh’s book has a recommended listening list which includes Dvorak’s Requiem, his Stabat Mater, the piece that first brought him international acclaim, as well as his Slavonic Dances. I found all of these on YouTube. So between my rehearsing the Mass in D, and working through our listening list, we will be learning the music of Antonin Dvorak this fall! This Carnegie Hall Listening Adventure colorfully highlights the primary themes, and indicates moving lines, and key instruments in the New World Symphony (Number 9) – good for short attention spans. This brief bio from Classical Net attempts to debunk Dvorak’s humble beginnings and completely ignores Dvorak’s Sacred works. Hmmmm…. This brief bio from Last FM has clips of the major acclaimed works, which might be better for younger children, since most of his works are fairly long. 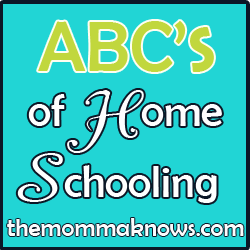 his post is part of the ABC’s of Homeschooling link up at The Momma Knows, and the Blogging through the Alphabet link up from Marcy at Ben and Me. I encourage you to click over to the link-up! One of the many rewarding aspects of homeschooling is the tremendous sense of community among homeschool moms, and the encouragement and helpful tips that are shared! Well, me too! We were halfway through our term before I figured this out! Grateful to the CM group for helping me out with my mental block!